The 34 metre sailing yacht Ocean Runner, listed for sale with Bart Kimman at Northrop & Johnson in Hong Kong, has had a further $850,000 price reduction. Custom built by Taiwanese yard Ta Chiao Chu Yachts to a design by Massimo PaperiniOcean Runner or Da Run Fa in Chinese, was delivered in 2009 as a contemporary styled fast maxi sailing yacht. The interior of this yacht for sale is very modern and functional for racing and cruising. She has yet to prove her paces and has only been lightly used as a daysailer. She is ready to go and capable of a few line honours on the Asian regatta circuit. She was designed and built to be both fast and stable in all sea conditions with her powerful sail plan and carbon reinforced composite hull. Her sleek underwater body is complemented by a bulb keel and efficient blade rudder. Her flush decks are teak laid and very spacious to offer great entertainment areas when at anchor while the interior is purposeful and practical. Ocean Runner has a no frills interior without compromising comfort. The cockpit companionway gives access to a spacious saloon area with identical seating areas for eight guests on the port and starboard sides. Likewise there are two large navigation stations on either side, fully equipped with all modern seagoing electronics and navigation gear - mainly Furuno. The saloon forward bulkhead is equipped with a large 42 inch HD television screen. Forward is the galley which is fitted out with all relevant professional equipment to accommodate a full time chef. Accommodation is for six guests in three cabins. Forward is a large master suite with twin beds while further aft there are two twin cabins, one to port and one to starboard, and all cabins have flat screen televisions and en suite shower facilities. All in all, while the accommodation is not sumptuous, it is comfortable and very spacious. Depending on the yacht's future owner, the interior could easily be made over to suit a more luxurious and less functional taste. 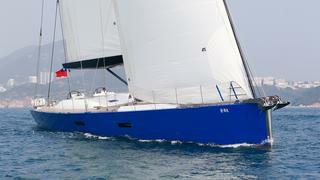 Lying in Taiwan, Ocean Runner is down to US$1,950,000.